The year out, or internship, in a professional practice can be the most rewarding experience in an architectural student's education. It can also be a shock to the system to find that architectural working practices are very different to architectural study. This book provides a beginner's guide to professional practice and a step-by-step guide on how to find the placement that best suits your goals. It is the fourth title in the successful 'Seriously Useful Guides…' series. Strategies: Employment Agreement and other options; 7. The Architectural Office: What are the Choices: Codes, Norms and Expectations: Benefits: Ethical Considerations: Clients: Case Studies; 8. Practices in the Built Environment: Contractors and Construction Management: Project Management: Engineering: Interior Design: Landscape Architecture: Urban Design: Sustainable Design: Case studies; 9. Emerging Technologies: Digital Media, Video and Animation: Case Studies; 10. 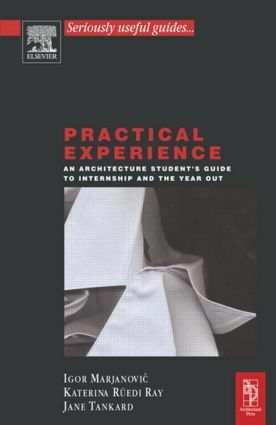 Critical Practices: Traditional vs. Critical Practices: The Importance of Critical Practices: The Context of Architectural Practice: Case Studies; 11. Afterwards; 12. Some useful reading.